This book sheds clear light on the current international contours of competition law vis-à-vis communications, and provides deeply informed insight and lessons to be learned from experiences in several countries. With a primary focus on Brazil, which alone in the world to date has legislated what can be called an Internet Charter – the Net Mundial statement – the book discusses significant legislative, regulatory, and judicial developments in the United States, the European Union, Canada, China, Chile, Singapore, and elsewhere. With 31 contributions, it is based on debates triggered by two gatherings of regulatory lawyers of Communications and Competition IBA Committees, held in Rio de Janeiro in 2013 and in Prague in 2014. Lawyers and officials struggling to fit communications matters into a competition law framework will greatly appreciate this book and the global awareness and guidance it imparts. It is sure to be read closely and used by both practitioners and policymakers in the years to come. Foreword by Michael J. Reynolds. Foreword by Cristianne Zarzur & Tito Andrade. Foreword by Daniel A. Crane. Part I Convergence, Takeovers and Mergers in the Communications and Technology Industry: Comparative Experiences. Chapter 1 Introducing Diversity in EU Merger Control Yvan Desmedt & Philippe Laconte. Chapter 2 Summary of Recent U.S. Enforcement Decisions in Communication/Entertainment Industry Transactions Ilene Knable Gotts. 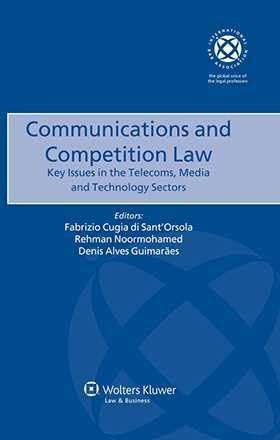 Chapter 3 Competition and Regulatory Aspects of Convergence, Takeovers and Mergers in the Communications and Media Industries Thomas Janssens & Joep Wolfhagen. Chapter 4 Brazil’s Antitrust and Regulatory Reviews of TIM/Telefonica: Lessons Learned Ana Paula Martinez & Alexandre Ditzel Faraco. Chapter 5 Changes in the Global Telecommunication Market and Its Implications in Brazil Gesner Oliveira & Wagner Heibel. Chapter 6 Mergers in the Canadian Communications Sector: An Increasingly Curious Situation Lorne Salzman. PART II Looking Ahead: New Markets and Competitive Hurdles in the Offering of Globalized Services. Chapter 7 In Search of a Competition Doctrine for Information Technology Markets:Recent Antitrust Developments in the Online Sector Jeffrey A. Eisenach & Ilene Knable Gotts. Chapter 8 The Internet of Things in the Light of Digitalization and Increased Media Convergence Anna Blume Huttenlauch & Thoralf Knuth. Chapter 9 Dynamic Markets and Competition Policy Bernardo Macedo & Sílvia Fagá De Almeida. Chapter 10 Recent Antitrust Developments in the Online Sector Federico Marini-Balestra. Chapter 11 Mobile Payments and Mobile Banking in Brazil: Perspectives from an Emerging Market Márcio Issao Nakane, Camila Yumy Saito & Mariana Oliveira e Silva. Chapter 12 Internet of Things: Manufacturing Companies Industry and Use of "White Spectrum": Ghost in the Machine? Kurt Tiam & Andy Huang. Part III Intellectual Property and Competition in Electronic Environments. Chapter 13 Competitive Aspects of Cloud-Based Services Fabrizio Cugia di Sant’Orsola & Silvia Giampaolo. Chapter 14 Standard-Essential Patents and US Antitrust Law: Light at the End of the Tunnel? Leon B. Greenfield, Hartmut Schneider & Perry A. Lange. Chapter 15 IP and Antitrust: Recent Developments in EU Law Miguel Rato & Mark English. Chapter 16 Antitrust Cases Involving Intellectual Property Rights in the Communication and Media Sector in Brazil Barbara Rosenberg, Luis Bernardo Cascão & Vivian Terng. Chapter 17 Patents Meet Antitrust Law: The State of Play of the FRAND Defense in Germany Wolrad Prinz zu Waldeck und Pyrmont. Part IV Power over Data. Chapter 19 The Transatlantic Perspective: Data Protection and Competition Law Pamela Jones Harbour. Chapter 20 Power over Data: Brazil in Times ofDigital Uncertainty Floriano De Azevedo Marques Neto, Milene Louise Renée Coscione & Juliana Deguirmendjian. Chapter 21 Big Data and the Cloud: Privacy and Security Threats of Mass Digital Surveillance? Lyda Mastrantonio & Natalia Porto. Part V Open Internet and Net Neutrality.